Deirdre is currently Director of Education for ‘I CAN’, the National Charity which supports children with communication difficulties. The charity runs two special schools and a large social enterprise providing training and resources to support students with speech and language difficulties. Deirdre is also an Ofsted inspector and a school improvement partner. She currently sits on the executive of SWALSS (South West Alliance Of Leaders in Special Schools ) and is asked to speak on leadership at numerous conferences. 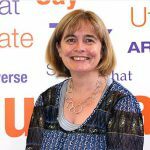 In the recent past she has also been a DfE Advisor, Headteacher and Senior Advisor for Mainstream and Special Schools in a Local Authority. Deirdre has two children and lives at home in Swindon, Wiltshire, with her husband and dog, Bob.